This is easily one of the most asked questions by competitive players out there. Mike Bianca shares his incite and describes why the current PR1ME relationship with its newest 2011 sponsors came about. Ah, that delectable and evasive word that every paintball player strives for and dreams of in delusionary states of grandeur. To be or not to be?... that is the question. To be or not to be... sponsored! To a paintball player, that word invokes a number of emotional and conceptual reactions. To many it lends a sense of accomplishment. Others feel it validates them as a player or a team. Some see it as the only means in which to participate at a certain level of competition. Whatever it means to you or your team, more than likely, it is going to be a positive perception to most. Dear Animal Customs: Sorry. The jerseys are all clean now. Left to Right: Vince, Griff, Chris aka "Smoker", Mikey, Danny. Team Pr1me is no different. We have all wished for that day to come where we would be considered good enough for a paintball company to want us to represent them. Many of us have experienced this euphoric state before. But really think about that. As a divisional team, is being sponsored really about how good we are and how we will grow the sponsor's sales? Doubtful. What kind of impact do you think the paintball companies get from Pro teams repping thier product? A lot more than that of a D3 team right? Most teams will take the first thing they are offered or they will actively search out a "deal". They will go with what they like. And why not? Most of the larger paintball companies have package deals where a team will get a discount. All of this is great but all of that is also business. 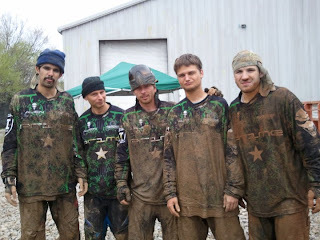 Team Pr1me specifically chose not to jump on any band wagon our first year. We were in a unique position where we wanted to set our own goals and we wanted to reach them our way. We wanted to prove we could win. And we did. The last thing we wanted was to go to a company and say, "Hey, we're good. You should sponsor us." Why? What could we bring to the table that first year? Nothing. We didn't want to be a team sponsored by a company just because we could. Instead, we wanted to go to specific sponsors with a winning record and a plan. That's right, a plan. A plan to become a business partner and not just a team that uses their product. And we feel we have made some great choices for this season. Shooting the 2011 Alien Independence from Alien Paintball. A stretchout session prior to another practice at the ranch. We chose these two companies because of our David and Goliath mentality. No one thought a team from Alabama could be competitive on the regional and national circuits. So far, we have shown that we can. Same goes for Alien and Exalt. They both spit in the face of the mainstream and stand defiant and successful. Pr1me was drawn to that tenacity as we share that same drive. Thank you to Jack at Alien PB and Nolan at Exalt PB. Both of you are class acts and we look forward to furthering a great 2011 season with you. 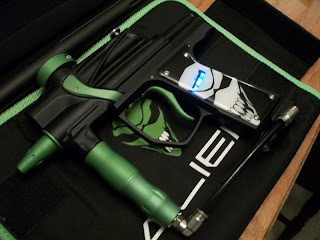 Prime Paintball: Official Exalt and Alien Dealer! Well folks, may team PR1ME and Prime Paintball may have kept quiet for the past month, rest assured we've stayed busy. We are proud to announce that we are now official Exalt and Alien dealers. That means you can get the best deals going in the southeast from guys who've been around the circuit for a long time. For those of you looking for high grade paint or even some shoot around ammo. We'll have a healthy stock of GI Sportz paint on hand. 1, 2, 3, and 4 star. Don't hesitate to ask us what we think of the newest, most popular paint company on the block! Be prepared for an onslaught of updates, articles, photos, and deals!